Question: Bill - When I was replacing an outdoor house light - I noticed 2 ground wires connected to the same ground terminal. I am pretty sure this is no longer standard practice in the industry. 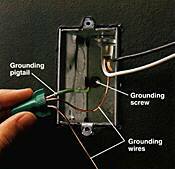 My question is - can I just connect one of the ground wires to another part of the same "metal" bracket the current ground wires are attached to, or should I use a pig-tail to connect the 2 ground wires? The metal bracket already has holes drilled and a screw will securely attach the ground wire. Thanks in advance for your time. That is a good question. There is no real rule as to how you connect the ground wires in an outdoor light. You just need to make sure that all metal parts of your installation are mechanically connected to the homes ground. I would place all your grounds under one wire nut and then use a jumper or pig tail to ground the bracket, box and light.